Every time I start to think “hey maybe I’m not such a bad pilot after all”, I come across something like this which puts me back in my lowly and humble place. Impressive doesn’t even begin to describe it. I remember thinking that Lake Elsinore seemed a bit small for a flying boat with a wingspan greater than that of a 747, especially when they need to be flying it on the step across the water for nearly a minute to scoop a full load of water. 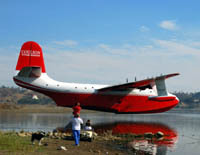 The Martin Mars is not quite as big as the Hughes H-4 Hercules (better known as the Spruce Goose), but then again that airplane only flew once for a few seconds, whereas the Mars has been in active service for well over half a century (ladies, remember that lesson: size isn’t everything). The Mars, built during World War II, was originally designed by the Glenn L. Martin Aircraft Co. as a long-range bomber. It never saw use in that capacity, however, and served during the war as a troop transport moving people and supplies between Los Angeles, San Francisco, and Pearl Harbor (see a full history). Since the war it’s primary use has been to fight fires. Seven Mars aircraft were built by Martin. One was lost to an engine fire in 1950, another to a typhoon, and a prototype fire bomber Mars crashed in 1961 during testing. Two of these giants remain: Hawaiian Mars and Phillipine Mars. They’re based on Sproat Lake up in Canada. 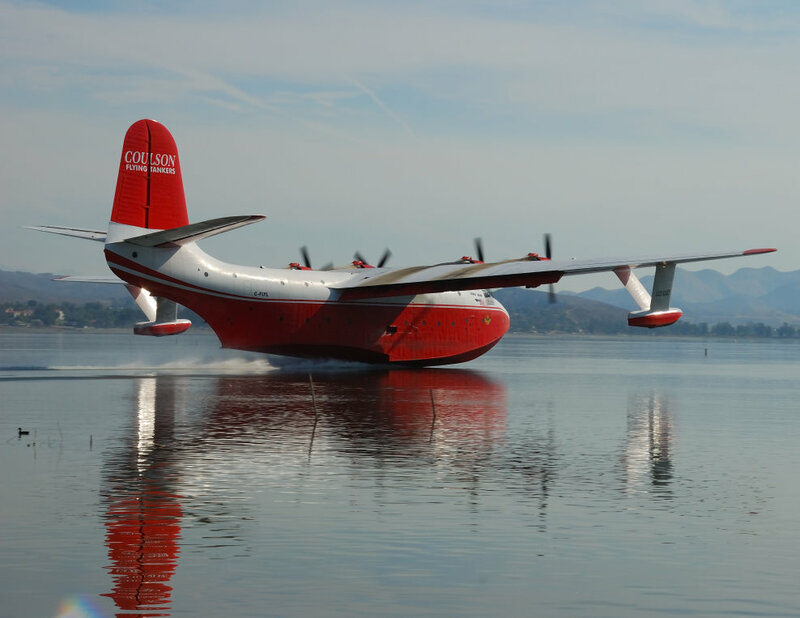 What impresses me most about these airplanes is that they’ve been sitting in water for about sixty years, yet they continue to soldier on in one of the most demanding applications in the aviation world. The corrosion issues, even if freshwater, must be daunting. The planes are hauled out of the water for the winter, though. You can see how they launch the Mars back onto the lake in this photo essay. A few years ago it looked like the Mars fleet would be grounded permanently. 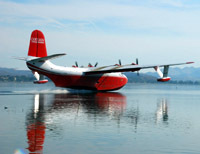 The owner and operator of the two remaining birds put them up for sale to any museum able to pay the asking price. I think it was just assumed that no one would be able to continue operating the Mars as a profitable business. As it turns out, Coulson Flying Tankers purchased the entire firefighting operation — aircraft, FBO, spares, etc. 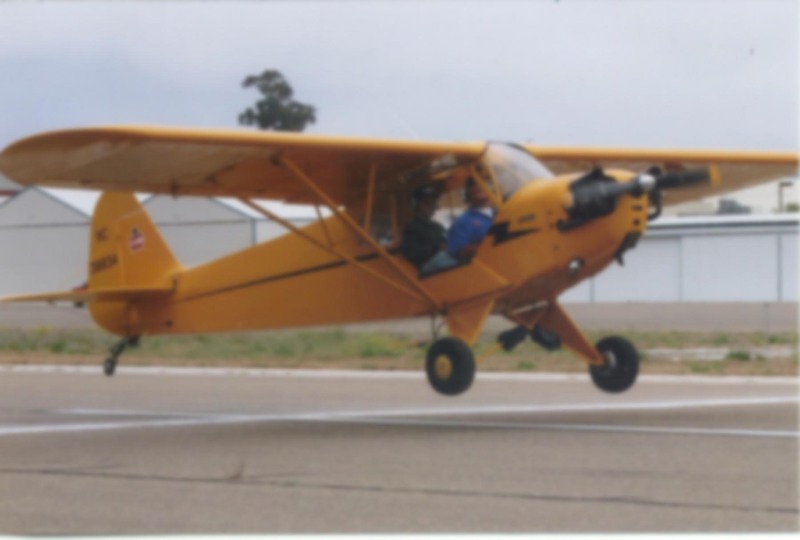 — and has, according to their web site, essentially rebuilt the airplanes from the ground up. My hat is off to Coulson; I can’t even imagine how much it must cost to keep those suckers airworthy. Each of them has four 2500 horsepower Wright-Cyclone R3350 radial engines. They stopped making those engines fifty years ago. The fuel burn is nearly 800 gallons per hour. At $4.00 per gallon, that’s $3,200 per hour for fuel alone. I don’t even know where you could get a supply of 100LL fuel large enough to keep those airplanes fueled. Most fuel farms of sufficient capacity stock Jet-A, not avgas. Plus, those farms are nowhere near lakes. I assume they fuel the aircraft from trucks. Another logistical hurdle. Overhaul and maintenance reserves are probably at least as costly as fuel. Add in the support personnel and equipment, insurance, and ancillary expenses and figure a grand total of about $15,000 per hour to operate the Mars. Of course, for that price, you get the ability to drop 7,200 gallons of water on a fire every nine minutes for six straight hours. That’s 265,000 gallons between refuelings. 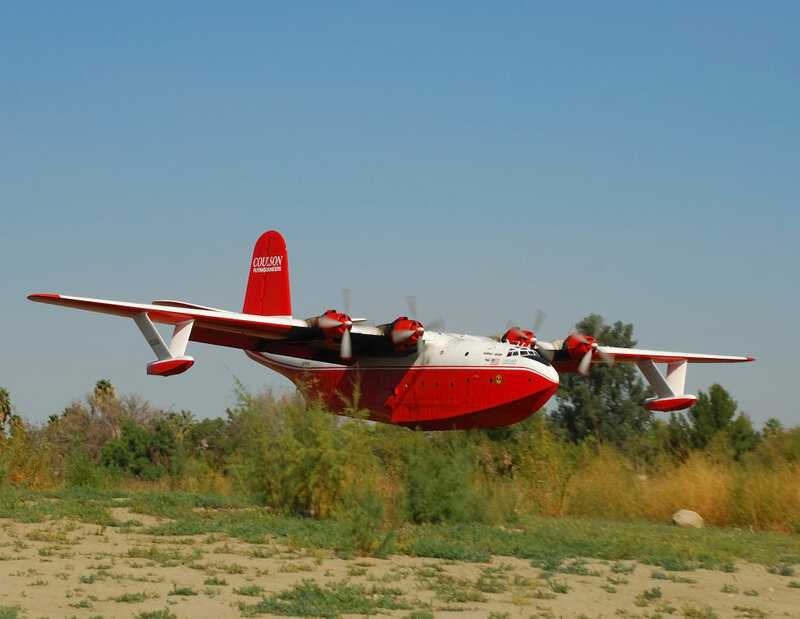 With both airplanes alternating shifts, you could theoretically drop 1.06 million gallons of water on a fire per day. Keep them both in the air and the total is 2.12 million gallons per day. In practice it wouldn’t quite reach that level because one of the Mars aircraft has a lower fuel capacity than the other. But you get the idea. Any way you slice it, it’s a lot of water. Nothing else even comes close. 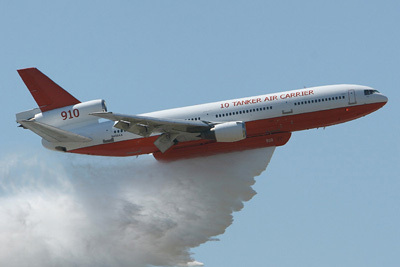 There is a DC-10 airliner which has been converted to firefighting duty. It carries a bit more water, but it must return to the airport in order to reload. The Mars can skim a lake or ocean for a minute and be back on station far faster than any DC-10, and it has the capacity to mix fire retardant foam with the water while enroute. Perhaps the day of the flying boats is not yet finished. 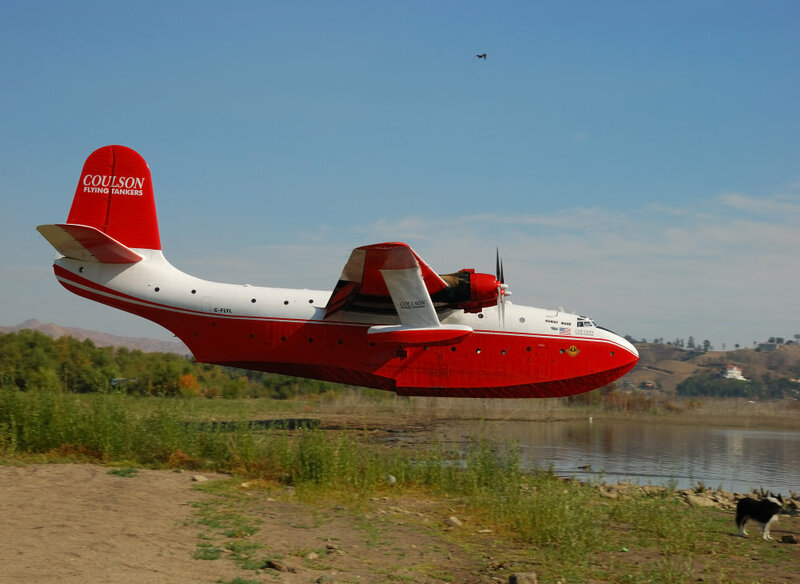 In fact, the only dedicated firefighting aircraft I’m aware of that’s currently in production is a flying boat: the turbine powered Bombardier CL-415. With the Southern California fires still fresh in our memory (actually, the Santiago fire is still burning), it’s worthwhile to consider how much worse the damage could have been were it not for these friendly giants. 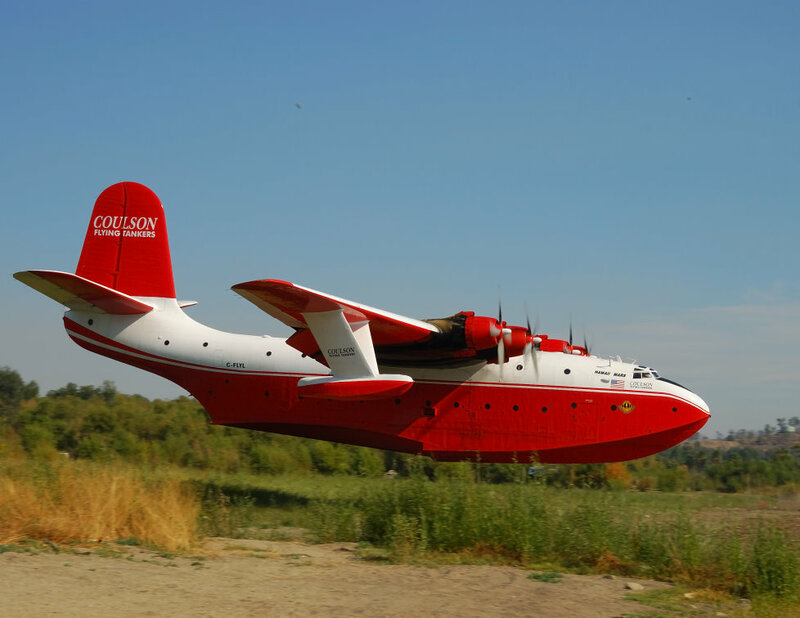 God bless the Martin Mars. Long may she fly! Would you like copies of the DC-10 Airtanker damage from the Kern County fire? Hmmm, we did get the same email, it’s probable that you got yours from a source nearer home though. I am right with you on the skill-set comments, they really get the job done. Great blog by the way, I will bookmark and pop a link on mine for you. Have you seen Evergreen International’s supertanker? I saw this thing when I was down in Arizona, they’re based at Pinal Airport…whenever this thing goes into use, it’s going to be able to take a pretty big bite out of a fire, that’s for sure! Besides the swept wings, one other problem with the DC-10 and 747 tankers is that they are powered by turbofans and take a while to spool up when you call for power while with props the power is almost instantly there. This may have been a contributing factor in the Airtanker scrape. I shot that sequence of the Coulson Mars coming in low to land at Lake Elsinore. The lens setting as it passed was backed off to 48mm to give you an idea how close I was.